Radiation injury occurs when ionizing radiation directly damages cellular RNA, DNA, or proteins, or when highly reactive free radicals are generated within cells and tissues. Large doses of ionizing radiation cause cell death, while lower doses interfere with cellular proliferation. Chromosomal damage can result in malignant transformation or inheritable genetic defects. On September 11, 2001, terrorist attacks on US soil raised concerns about the repetition of similar activities, including attacks on nuclear facilities or the use of nuclear devices. The detonation of a “dirty bomb” (a conventional weapon designed to scatter radioactive material) could expose a large number of citizens to high levels of radiation. The extent of tissue damage caused by radiation depends on the source and duration of exposure. 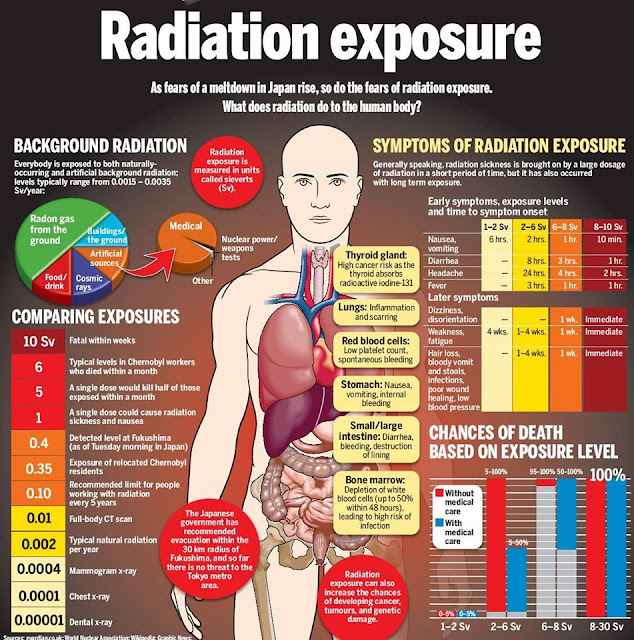 The majority of acute radiation syndromes are caused by gamma rays and x-rays because these forms of radiation can cause damage at great distances from their sources. Deterioration of unstable atoms, such as iodine-131, contributes to cellular injury. Cerebral syndrome: Universally fatal. Caused by extremely high, whole-body exposures. Prodrome lasts minutes to hours; insignificant latent phase, followed by tremors, seizures, cerebral edema, and loss of coordination. Death occurs within hours to a few days. GI syndrome: Death is common. Prodromal symptoms, often severe, resolve within two days. Latent period of four to five days is followed by intractable nausea, vomiting, diarrhea, dehydration, electrolyte imbalances, and vascular collapse. Bowel necrosis may occur, leading to sepsis. Hair loss is common. Survivors usually exhibit hematopoietic syndrome. Decontamination of exposed victims is critical following exposure, both to protect medical personnel and to limit progressive tissue damage. Wounds are checked with Geiger counters and irrigated until counts normalize. Ingested radioactive material should be removed by lavage or induced vomiting. Victims are isolated from other patients, and standard universal precautions are practiced by personnel. Symptomatic treatment is administered for shock, pain, anxiety, and anoxia. Cerebral syndrome is universally fatal; treatment is geared toward patient comfort. Seizure control and sedation are the mainstays of therapy. Aggressive fluid resuscitation, parenteral nutrition to provide bowel rest, antibiotic therapy, blood products and hematopoietic growth factors are administered as indicated. Stem cell transplants may prove useful for selected patients. Medications (potassium iodide, DTPA, or Prussian blue) may limit damage from specific kinds of radioactive particles. Survivors are at increased risk for various cancers, cataracts, and thyroid disease. These conditions are treated as they occur.